Well, we want to thank everyone for a wonderful 23 years of great memories. From the handful of teams that started the meet at North Monterey County to the 70 plus that graced the course today at Toro Park, we hope you enjoyed the meets over the years. With all of the celebratory details of the meets, it has always been the athletes and coaches who have made it one-of-a-kind. Thank you. On to the details! The day kicked off with the traditional open race and middle school races which bring a different touch and spirit to the event. Special thanks to the coaches who have ran over the years and have shown their athletes the way. The middle school races were packed and the future is bright! The 9th grade girls started off the showcase races and it was Grace Lathrop (Whitney) who got out early and never looked back cruising to a very fine 19:18 win and helped her team to victory as well. Madison Galetti (Clovis West-19:37) made it two from outside the area ready to spoil the CCS party. Christel Elkins (St. Francis-19:50) began what would be a very historic day for the Lancers of both genders! Los Gatos (3rd-105 pts. ), Mitty (2nd-98 pts. ), and Whitney (1st- 93 pts.) had a nice team battle to start the day. The 9th grade boys had some hype with a world record holder gracing the course. That doesn't happen very often in high school meets! Jeremy Kain (Scotts Valley) set the world record in the mile (4:36) for 12 year olds and kicked off his high school career with a nice win in 16:38. He smartly took his time early on and used his middle distance speed to kick past Cash Ebright (SLV-16:40) down the stretch. Those two will lock horns for years to come in their league races. Benjamin Reyes (Clovis West-17:11) settled for a distant 3rd. Jeremy helped Scotts Valley to place 3rd (232 pts) while Prospect (2nd-182 pts.) and Bellarmine (1st-97 pts) took top honors. I can't remember an Earlybird when Bellarmine didn't win a team race. The cupboard continues to fill for the Bells. The sophomore girls had 8 girls under 20:00 last year and they upped that to 11 today. Melissa Chicon was coming off a nice win last week at Chieftain and as predicted, she surprised the field with back to back wins at Toro in 18:53. After a conservative opening 6:18 first mile she bolted holding off defending champ Audrey Reed from Live Oak (2nd-19:01) and rising star Layla Ruiz from Watsonville (3rd-19:11). St. Francis (1st-46 pts) got their team wins going with Whitney (2nd-61 pts.) snagging some more hardware. Gunn (3rd-76 pts.) took the last coveted Earlybird medals. The sophomore boys had a newcomer run solo for his 2nd big invitational wins in as many weeks among the biggest field of the day. Collin Peattie (Bellarmine) was on everyone's radar after his stellar 4:16 mile as a 9th grader and after an opening 5:00 mile today he dusted everyone to a very fine 15:42 time making him the 2nd fastest Bellarmine Bell ever, and that's saying something with their tradition-rich program. 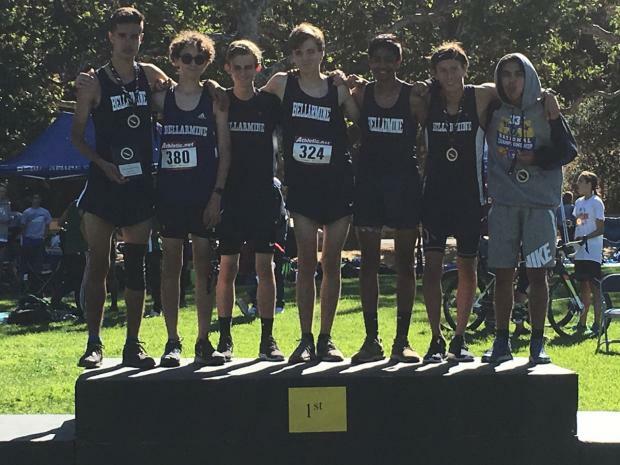 Nolan Topper (2nd-16:18) and Galen Topper (3rd-about 16:23 due to timing malfunction), made it a clean sweep for the Bells and sealed this team as the best underclass team we have ever seen at Earlybird. The Bells scored only 24 points in a massive field for their 2nd win of the day. Los Altos (142 pts.) and St. Francis (168 pts.) were a distant 2nd and 3rd. The junior girls had local star Angela Leavitt (Notre Dame-Salinas) sprint past the leaders in the last 100 meters to seal the win in 19:53. Clara Chirila-Rus from Leland (2nd-19:58) and Hermela Abrha from Willow Glen (3rd-20:02) timed their kicks just a bit too soon but will learn as the season goes on. Hermela spear-headed a nice Willow Glen (1st-41 pts.) team for the win with Leland (2nd-47 pts.) and St Francis (3rd-62pts.) next. The junior boys had Adam Sage (Los Altos) surge late in the race for the win in 15:47 after a pack hit the mile in 5:05. In the closest race of the day, Ethan Dodge (Whitney) was 2nd in 15:48 with his teammate Austin Vasquez 3rd with the same 15:48 time. St. Francis (1st-73 pts.) started to flex their muscles with Los Altos (2nd-84 pts.) and Clovis West (3rd-111 pts.) showing very well. The senior girls got a nice touch as the Earlybird founder, Coach Bruce White, was the honorary starter. Quinn Hagerman (Merced) was our heavy favorite and she didn't disappoint. After an opening 5:48 mile we knew she was ready to roll. The hills didn't slow her much as she stopped the clock at 17:52. That was fastest of the day and moves her to #12 All-Time at Toro Park beating some California legends. Her 40 second improvement from last year was quite impressive and sets her up as one of the top girls in California for this fall. Lila Roake (2nd-18:19) from Santa Cruz and Jessica Kain (3rd-19:02) made the front of this race look like solo time trials as Quinn spread the field out. San Benito (1st-35pts. ), Alvarez (2nd-63 pts. ), and Alisal (3rd-65 pts.) made it a clean sweep for the newly formed 30 school Pacific Coast Athletic League. The senior boys were also sent off by Coach White and we new with the entry list that this would be the best grade level team we ever saw at Earlybird and that the individual battle would be fierce. That's exactly what it was. Colton Colonna (St. Francis) and his teammate Eric Eng battled our defending champ Owen Mackenzie (Los Altos) throughout the race after an opening 4:58 mile. The see-saw action was impressive as they each took turns surging. Owen surged with 800 meters to go only to be over-taken late. As we thought he would, Colton sealed the win late in 15:21, fastest of the day. That time moves him to just outside the top 10 at #11 All-Time at Toro Park. Eric was close at 15:24 and is now #17 at Toro. Quite the 1-2 punch for the Lancers! Owen settled for a hard-fought 3rd in 15:36. St. Francis stormed as the best grade level team ever with 33 pts. Bellarmine (2nd-50 pts.) made two truly outstanding grade level teams. Los Gatos (154 pts.) was 3rd as the senior boys made the last Earlybird race truly memorable. Overall, St. Francis boys and girls made their Earlybird return a memorable one. St. Francis girls had the fastest combined team time (99:32) while Whitney (101:39) and Clovis West (102:03) made it two out of the area teams in the top three. Saint Francis was only 2:18 off their school record run of 2014. The St. Francis boys came in ranked 1st in CCS, 2nd Overall in California, and 5th in the United States and walked away with a team time of 79:02, good for the 2nd fastest All-Time at Toro Park behind their very own 78:41 park record set last year. The Lancers have all the tools in the shed to make their 2018 run a very memorable one with that type of early season effort. If their 5th man can shore up the back-end (66 second spread) the crew could be very, very dangerous. Bellarmine was dismissed by some coming in but we knew they would be a solid 2nd with their new addition up-front. Their 80:47 team time is just off their school record 80:09 from three years ago putting them right back into the state's elite once again and only 1:45 behind the Lancers. Don't discount the Bells! Los Altos (81:17) just missed their school record by 12 seconds and was just outside the top 10 all-time and will also mix it up with anyone. When all races were combined and scored, St. Francis walked away with the overall plaque breaking a long held streak by Bellarmine. Once again, from everyone at North Monterey County High School, we want to thank everyone for a memorable 23 years and we hope you enjoyed the last one!